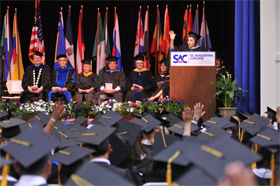 Graduates and their families harvested years of commitment and sacrifice at St. Augustine College’s 2012 commencement ceremony, which was held May 19th in an auditorium packed with over 700 people. Jan Schakowsky, U.S. Representative for Illinois’ 9th Congressional District, delivered the Keynote Address, highlighting the accomplishments of the graduates and reminding them that there is no limit as to how far they can go to reach their dreams and help others follow their path. Rocio Garcia and Epifania Lopez delivered the Valedictorian addresses, in which they emphasized that there is no obstacle that cannot be overcome to find success through education. Their experiences represent that of the young, recent immigrants and adult students, many of who had to navigate through the challenges of raising a family and holding a job to earn degrees and certificates.